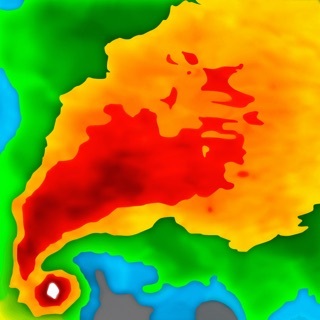 SEVERE WEATHER ALERTING – WHERE IT MATTERS, WHEN IT MATTERS. 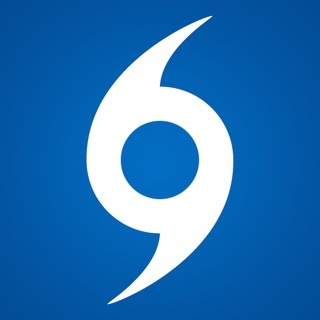 The Alabama SAF-T-Net® app alerts you to impending weather danger at locations like home, work or your kids’ school, so you can protect your family by knowing what’s coming—up to 15 minutes before the storm hits. 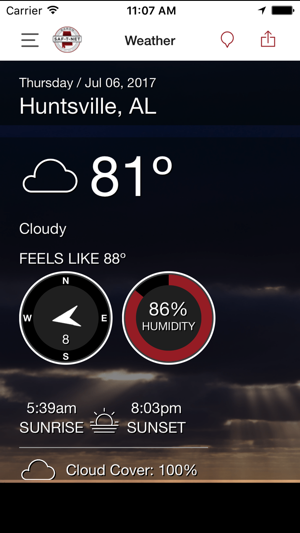 It’s also a great year-round weather app, compete with current conditions, forecasts and an easy-to-use weather map with radar, satellite imagery and more. The Baron-exclusive alerts are accompanied by a simple 1-to-10 ranking on the likelihood of a tornado within the approaching storm cell. Called the Baron Tornado Index (BTI), this ranking is more local and accurate than regional alerts. 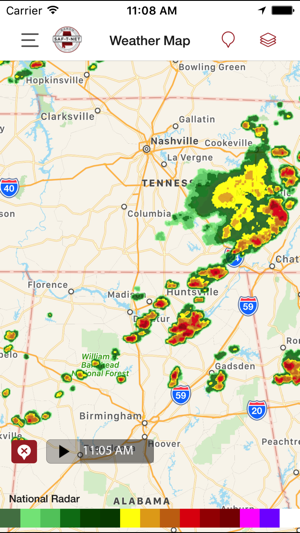 The Alabama SAF-T-Net app is also a powerful everyday weather app, with nationwide radar, forecasts, satellite imagery, current conditions and more. 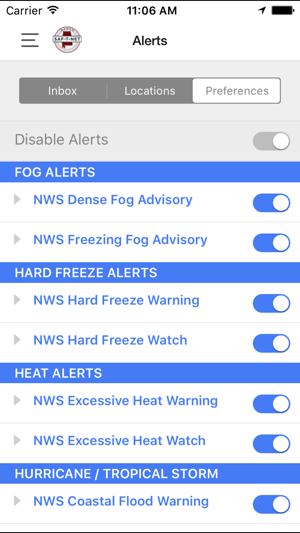 An easy-to-use slider lets you scan through the next 24 hours of forecasted conditions, so you can see what the weather will be like at times and locations important to you. ***NOTE FOR CURRENT SUBSCRIBERS TO TEXT MESSAGES, EMAILS AND VOICE CALLS FROM ALABAMA SAF-T-NET: To avoid receiving duplicate alerts from the app and your existing text/email/voice account, please text “stop” to 61872, or log in to your web-based account to disable your current alerts. Visit the FAQ page at www.alabamasaftnet.com to learn how to disable alerts. It is recommended that you configure alerts in the app before disabling your original account to prevent disruption in alerting service. 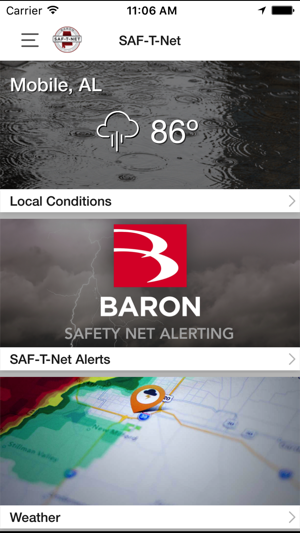 You can configure your weather notifications in the app by tapping the Alabama SAF-T-Net logo at the top-left of the screen, then tapping “SAF-T-Net Alerts” in the resulting menu tab. Then tap “Settings” at the top-right to set your preferences. • Locations for forecast data/map data and SAF-T-Net alerts are now all handled in a centralized location. 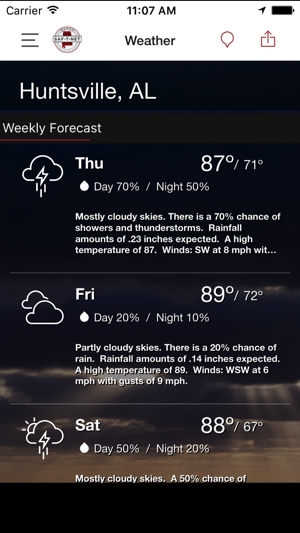 • The user’s selected locations are now consistent across forecasts and alerts, and don’t need to be managed independently. • SAF-T-Net alerts are now toggled on for the user’s location upon app install. New locations added also have SAF-T-Net alerts automatically turned on. 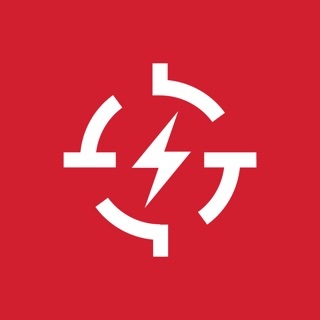 • Users can now choose whether to receive alerts from each separate location. • When a user clicks an alert notification, they are now taken to the map page showing the last viewed data product for that alert location. • A new 7-day forecast includes a written forecast for both day and night time. Copyright © 2017 Baron Services, Inc.